Saraswati the Goddess of Knowledge comes to Hindu homes sometime in winter according to the Hindu calender. 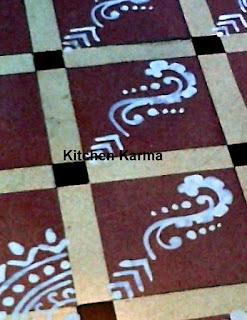 It is a very popular puja in Bengal and is celebrated in almost every house. 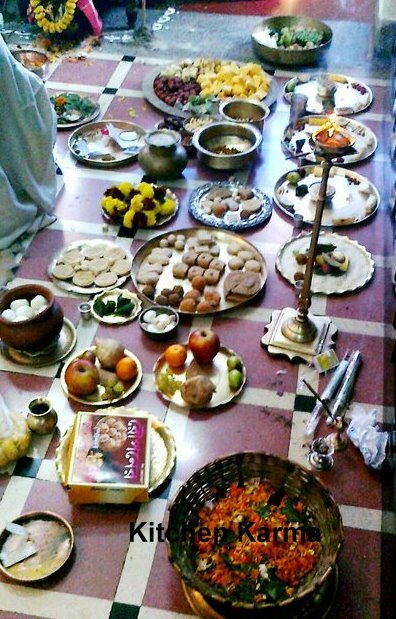 In our house the puja has been going on for more than 65 years. The whole family gathers for this puja and we spend the previous evening decorating the puja room with alponas. 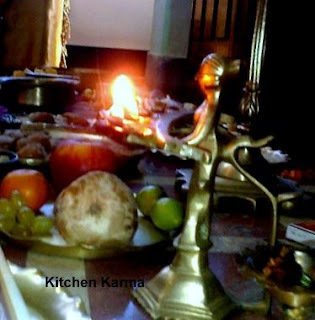 The two green fruits in the plate just above Kitchen Karma logo is a seasonal berry called kool in Bengali. It is in season only for two to three weeks. The folklore is if students cannot eat this fruit without offering it to Ma Saraswati first. 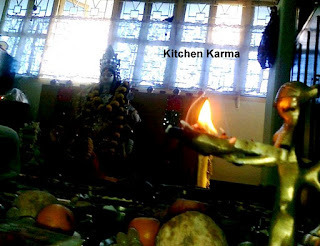 Since Saraswati is the Goddess of Knowledge and the puja comes during the final examinations in schools, no children dares to offend the Goddess. 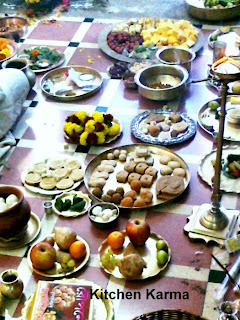 So we all wait in anticipation for the puja to get over, so that we can eat those kools. Wonderful times werent they...love the alpona...lovely spread for saraswati ma...Aruna.